There’s seemingly no end to the rainbow food trend this summer as dessert spots and bars continue to offer multicoloured ice cream cones, bars, smoothies and cocktails to satisfy our need for cheerful-looking sweets. But there’s one colourful dessert that you’ll be hard-pressed to find at a restaurant nowadays: the flavoured gelatin dessert, or Jell-O, as most people have associated the dessert with the brand that has pushed it into the mainstream more than a century ago. 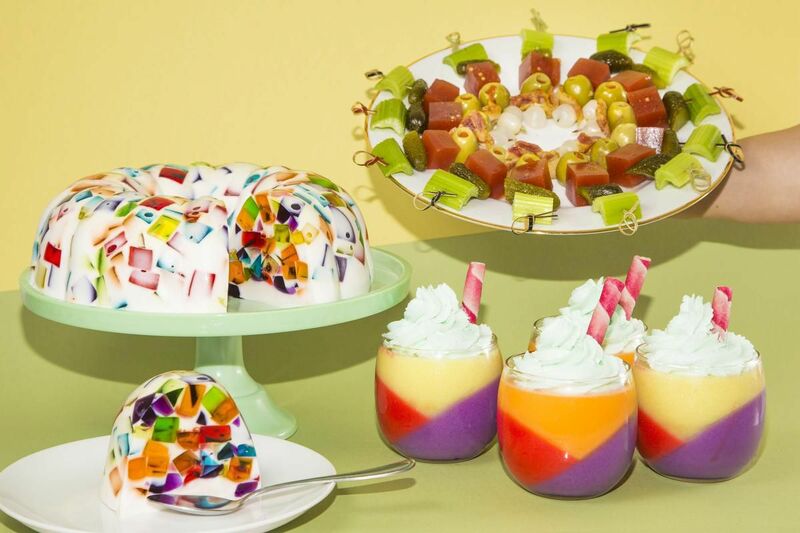 The no-bake, next-to-no-prep, chilled dessert that even kids can make seems like the perfect summer treat, but decades of nightmarish aspic moulds have turned generations of dessert lovers off Jell-O, making it more of a culinary relic. But I believe that gelatin moulds, when done right, can be a feast for the eyes and the taste buds, bringing a fun nod to nostalgia while being a tasty dessert fit for the Instagram generation. This is a tribute to the notorious aspic moulds found in cookbooks throughout the ’60s and ’70s — except this updated version is actually tasty. It’s also a grown-up version of Jell-O shooters, but feel free to omit the vodka. I’ve turned the classic Caesar cocktail into little gelatin cubes skewered with gherkins, olives, bacon and pickled onions that is sure to be a hit at any party. The key is to add enough spice to the Caesar so that it doesn’t taste like bland tomato jellied soup when it sets, keeping it bite-sized (some things are better in small amounts) and pairing the jellied Caesar with garnishes to add a contrasting texture. In a bowl, whisk together Clamato, lime juice, Worcestershire sauce, hot sauce, black pepper and salt. Taste and adjust seasoning as necessary. Transfer half of mixture in a small saucepan and bring to a gentle simmer over medium heat. Do not boil. Meanwhile, whisk gelatin and vodka into unheated tomato mixture. Add heated Clamato mix and whisk until gelatin has dissolved. Pour mixture into a square food storage container (rectangular black plastic takeout food containers work best). Refrigerate until firm, preferably overnight. Use a thin, flexible knife to help wedge out gelatin. Cut into 1/2-inch (0.6-cm) cubes and skewer with desired garnishes. Sprinkle celery salt on jellied Caesar cubes just before serving, if using. This gorgeous centrepiece requires two parts of chilling: one day to chill the colourful Jell-O before cutting it into small confetti-like cubes and another day to set the coconut milk that’ll hold everything together. Gelatin generally sets in four hours, but I like to chill it overnight just to be extra safe. I love the flavour of coconut, as its fairly neutral flavour pairs well with each of the six gelatin flavours I used (grape, blue raspberry, strawberry, lime, lemon and orange). Serve it with sweetened condensed milk and sliced fruit for an extra retro vibe. This recipe uses a 12-cup bundt pan/gelatin mould. In a small bowl, whisk together flavoured gelatin, unflavoured gelatin and cold water until gelatin has dissolved. Whisk in hot water until everything is smooth and there are no more granules. Pour mixture into a bowl or a small square food container or bowl and chill for at least 4 hours or overnight until it has set. Use a thin paring knife to help remove jelly from mould. Cut jelly into small cubes and repeat with other gelatin flavours. Spray mould lightly with cooking spray. Sprinkle flavoured gelatin cubes into pan in an even layer. Refrigerate until ready to use. Place half of coconut milk in a small saucepan and other half in a mixing bowl. Add sugar to a saucepan over medium heat. Add unflavoured gelatin to mixing bowl and whisk until it is no longer clumpy. Whisk sugar in saucepan until dissolved and coconut milk comes to a gentle simmer. Do not boil. Pour heated coconut milk mixture into bowl of coconut milk with gelatin. Whisk until everything is dissolved. Let cool for 10 minutes, or until cool enough that it won’t melt flavoured gelatin cubes. Pour mixture into mould, making sure coconut milk completely covers flavoured gelatin cubes. Chill for at least 4 hours, preferably overnight before serving. Remove mould by turning it on to a serving plate to let finished dessert slide out. Great for cakes, ice creams, puddings and even more jelly cups, this three-ingredient whipped cream takes on a beautiful pastel colour from the gelatin mix as well as a subtle fruit flavour. For a dairy-free version, use a can of coconut cream that’s been chilled overnight and whip the coconut cream solids that have risen to the top. In a stand mixer or a large mixing bowl with a hand whisk, add all ingredients and whisk until stiff peaks have formed, careful not to over mix (the cream will start to separate into butter and buttermilk). Use immediately or chill for a few hours before using. Makes about 2 cups (500 mL) whipped cream.